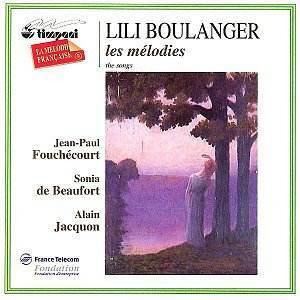 The early death of Lily Boulanger at the age of 25 robbed music of one of the best talents of the earlier 20th century. Just as music lovers think of the great Schubert (who died at 31) as one who achieved miracles of creative work, so too Boulanger touches anyone who knows her work. This admirable collection of songs and piano music does great credit to everyone involved: the artists, the recording engineers, the producer, the booklet editor. Just as a live performance benefits from a striking opening, so too a CD, especially if the music is not already known. And that is the case here. Jean-Paul Fouchécourt has a most appealing tenor voice, and has admirable breath control. The first of the collection of Clairières de la ciel - Elle était descendue au bas de la prairie (She had gone down to the bottom of the meadow) (TRACK 1: 0.00) - is a beautifully judged little song, less than two minutes long, yet full of subtleties in both the vocal line and the accompaniment. The collaboration of Fouchécourt and his accompanist, Alain Jacquon, is highly successful, and the subtle support of the piano part surely helped the tenor to produce the confident control of vocal shadings that are a feature of his performances. Nowhere is this control heard to better effect than in the beautiful slow mélodie Parfois je suis triste (Sometimes I am sad) (TRACK 3: 0.00). The tempo is actually very bold in its slowness, yet the tenor carries the day with the utmost conviction. These songs are quite delightful, showing a subtle and sensitive response to the texts from Francis Jammes's collection of 'Tristesses', published in 1914. It seems somehow appropriate that they were among Boulanger's last compositions. The Trois morceaux for piano give Jacquon the chance to take centre stage. They are engaging miniatures, following the example of Fauré. The performances are nicely shaped if a little closely recorded (TRY TRACK 14: 0.00. D'un vieux jardin). If Jean-Paul Fouchécourt has a pleasing vocal timbre for this repertoire, the mezzo-soprano of Sonia de Beaufort is equally rewarding. The four songs collected here under the bland title Quatre mélodies all show the benefit of having French songs sung by a native singer. Is there another field of the vocal repertoire in which the nature of the language has more strongly influenced the nature of the music? Three of these songs are charming pieces on the smaller scale, but the last of them is more substantial. Dans l'immense tristesse (TRACK 20: 0.00) is a substantial work of nearly five minutes' duration, and the challenge of performing it goes way beyond simply singing the notes. There has to be an altogether closer exploration of the relationship between the text and the music, and of the larger issues of phrase and structure. Clearly careful preparation and rehearsal, and the need for true teamwork, are uppermost here. Given the precedents found elsewhere in these performances, both singer and accompanist rise to the challenge of this fine song. The production standards on this Timpani disc are very high. There is a well written essay by Harry Halbreich and all the songs have full texts and translations. This is altogether a most distinguished issue, and I hope it becomes as widely distributed as it deserves to be.